Yarn: HandMaiden Sea Silk in Moss, 1 skein (438 yards), used up almost in its entirety. A gorgeous pattern, knit with divine yarn, with a most pleasing result – it will be difficult to top this one. The melon stitch which makes up the center panel was ridiculously easy to execute and remember. What’s more, it looks open and airy when spread out, full and textured when scrunched together – delightful either way. My modifications to the written pattern were slight, all driven by my limited quantity of yarn: I worked the center panel over 50 stitches rather than the specified 70, and substituted the narrow point border (p. 183) instead of the wider one suggested in the pattern. Attaching the border wasn’t too complicated, and the instructions in the back of the book were very helpful when it came to rounding the corners. Only the short edge of the scarf gave me a bit of trouble – initially the border looked too bunched up. However, this situation was familiar to me, and a little fudging fixed the problem. I found HandMaiden Sea Silk a little sticky when worked on plastic needles, but it moved along smoothly on Addis. 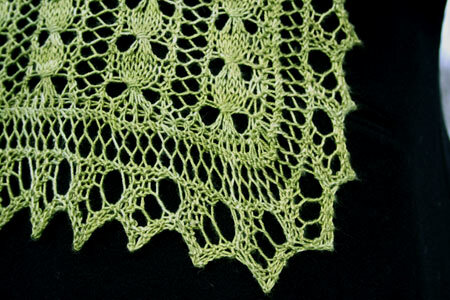 The yarn has a soft and drapey hand when knit up, though the fiber itself is very tightly spun – no splitting whatsoever! At the same time, it’s balanced, so no icky twisting on itself. I was worried about blocking such a firm and resilient fiber, but it really wasn’t a problem. Last, of course I sniffed the yarn! With 30% SeaCell content, I expected a whiff of the sea every time I took the project out. But… I didn’t smell anything, contrary to what so many of you have found. Maybe I got a faulty skein??? I’d absolutely use this yarn again to double check :). Looks lovely! You’re too funny with your calculations. And I definitely think you’ll have to get another hank for the smell test. Absolutely stunning! and I can’t believe how quickly you knit it! really pretty. i love the fact that it’s such an old lace pattern but looks so “right” on you today. 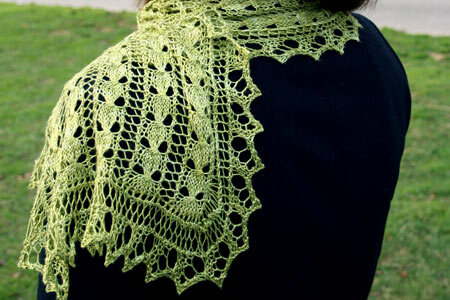 i agree with what you mentioned in an earlier post–stoles and scarves are the way to go with lace knitting. no frumpy grandma look, but you still get all the pleasure of knitting lace. It’s very beautiful, like all your knits. I have been coveting some of that yarn for ages. What a gorgeous scarf, Kathy! Inspires me to get a skein or two of Sea Silk myself.! Well, you might be able to remedy the sea smell situation by zipping up to Porter Sqaure and getting some kombu (Laminaria japonica) from one of the Japanese grocery shops. The scarf is really lovely (here I may be repeating myself), and I am now equipped to make one as well; upon your recommendation, my odd uncle sent me a copy of the book. I love your scarf! I have this book too, but haven’t yet started a project from it. 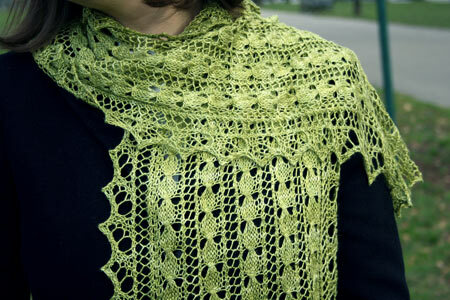 I have this gorgeous light aqua merino that is begging to be made into something like this. Your recommendation of the pattern makes me think it would be a most smashing scarf pour moi. It’s gorgeous – the yarn really makes that pattern stand out beautifully. I’ve started one in cashmere. You’re right, the pattern is really easy. I like the border you put on it, too. That is a very beautiful scarf. It is perfect on you too. Great job!! Love, LOVE it.. that color is gorgeous and so is the scarf! What a beautiful scarf. doing the math was more than worth it for this finished product. You did a great (logical) job. So beautiful! You are definitely a Knitting Goddess! Absolutely beautiful. You’ve inspired me to get the book and knit the scarf. However, I’m going to get more than enough yarn to complete the project as written! No math for me! You look just lovely in your new scarf. What a beautiful color. Nice knitting work, too! Just lovely! Wear it well! GORGEOUS. I’d call it a 100% success story. As for the “sea” in seacell, I don’t think it smells all that fishy (or maybe I just don’t have all that sensitive a nose!). Gorgeous!!! The color, the pattern, everything about it is awesome! That is magnificent. The color looks just like springtime to me, too. What a boost in the middle of winter. Well done! It looks beautiful! Especially with the black coat! I love it. I’m so impressed by your diligence – I would have just bought another skein just in case I didn’t have enough. Once I realized I’d make it with just one skein, I’d sigh and resign myself to knitting something else with such a beautiful yarn. Aw, too bad, right? Glad to read your comments on Sea Silk. I have a skein in my stash. 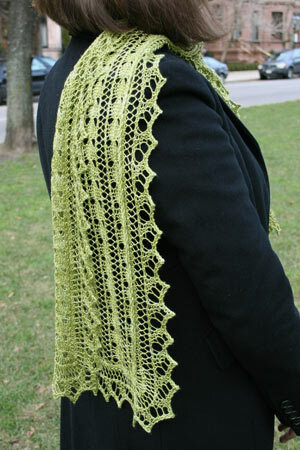 After seeing that beautiful moss green scarf/wrap, I just might have to buy that book on lace! How beautiful. It’s really neat that you squeaked that much scarf out of one skein, too. PS I really notice a difference with the new camera. (Not that before was icky or anything, mind you. 🙂 Great pictures. Absolutely gorgeous! Great color, great yarn, beautiful pattern! I think I’ll have to run out and get this book immediately! (you are my heroine knitter chic – I wanna be you when I grow up hahaha) if I’m not grown up at 37 I think it’s hopeless, though. Absolutely stunning! The narrow point border looks great-keeps the focus on the pretty melon stitch. Totally 100% awesome. Nothing else to say about it. The color looks very fresh on you; spring is around the corner! I have one skein of Sea Silk that I’ve been hording and wondering what to use it on. Seeing your scarf is very motivating!! Thanks for sharing Grumperina! Love the scarf–I have a skein of SeaSilk that I’ve been holding on to, and now I’m itching to start something lacy with it. You’ve really made the most of the single skein. Breathtaking! I love the color and that pattern is truly gorgeous. Your scarf is absolutely gorgeous. Well done! As for the smell, my only smelled when it was wet. Gorgeous! I got this book as a Christmas gift and when I was flipping through it and saw this pattern, I thought of you. Beautiful! If this unseasonable weather keeps up you’ll be able to wear it a lot (as opposed to swathing your neck and noggin in wool-ier scarves). BEAUTIFUL. I must put that book on my must “buy with Christmas gift card” list. I just so happen to have 1 skein of Sea Silk…..
it’s beautiful, kathy! and what a gorgeous colour. 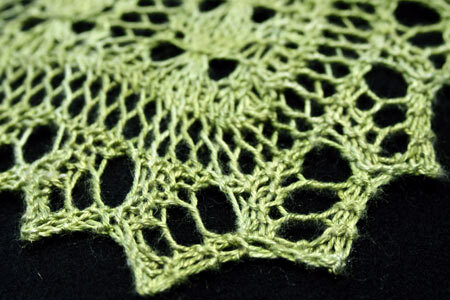 i just got the victorian lace book – will definitely try it out soon. Ohmigawd that’s gorgeous. Nice photo shoot, too. Beautiful. It makes me change my mind about square lace patterns. As for the lack of smell–I’ve sniffed Sea Silk and didn’t think it smelled anything like the ocean. And I read somewhere (I can’t remember where) that there’s something on the order of Beautiful. It makes me change my mind about square lace patterns. As for the lack of smell–I’ve sniffed Sea Silk and didn’t think it smelled anything like the ocean. And I read somewhere (I can’t remember where) that there’s something on the order of <1% seaweed in that yarn, so I wouldn't expected it to smell like anything other than silk. 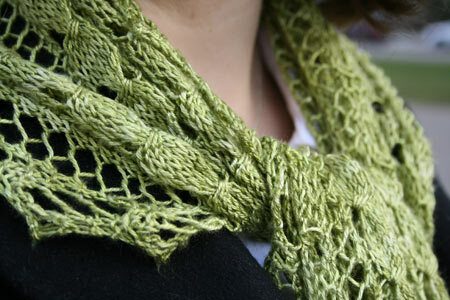 I’m so making this scarf with the one skein of Sea Silk I have. Thanks for telling how you did it. The color, the fiber, the pattern–PERFECT. It’s such a graceful look. it’s gorgeous! love it. great color and it looks fabulous on you. I don’t know how you do it, but you clear every knitting hurdle then turn around to set the bar higher. Beautifully done, Kathy! Merry Christmas to yourself, I’d say! It’s fantastic. That’s a lovely piece of work and it looks very nice against your dark coat. How does it react to being tied as seen in your picture? I have one lace scarf and I find it tends to bunch in on itself with wear. So I hesitate to knit a new one. I don’t relish blocking my lace scarves every week. That is exquisite! I love the green color too! Beautiful. The presentation is a pleasure too. So beautiful… I can’t wait to get that book! I just got the book in the mail today (a slightly late holiday gift), and I’m very inspired by your success with that pattern. I’m also super excited because I’m using some gift $ to order my first skein of sea silk. a truly lovely knit. i love the color, the pattern, everything. Truly gorgeous. Looks great on you. Congratulations! Just exquisite! Beautiful yarn, beautiful knitting, beautiful photos! Beautiful! You did such a great job. So Gorgeous! I expect nothing less, and you always deliver more than I expect. I love this blog! Absolutely stunning. I love the way everything came together into such a perfect scarf. That is absolutely gorgeous, Kathy!! I love the colour too. wonderful modifications. the edging MAKES it for me. Love those big holes in the scallops. Thanks for the great photos too. Just beautiful — the color, the pattern, the result. I love to sniff yarn, too. Gorgeous. I adore that color (I used it myself). I found that my Sea Silk Swallowtail did not really have any smell after blocking. Before blocking, the yarn had a vaguely sweet smell, but nothing I would associate with seaweed in particular. It’s lovely 🙂 I’ve a skein of Seasilk too, and I just keep petting it! It does smell a little of the ocean…however, since only about 5% or less of it is actually seaweed fiber, I highly doubt the smell is original. Probably dyeing odors or silk processing or something. But I don’t care! Melon scarf turned out marvelous!! I’m truly inspired 🙂 Happy New Year Kathy! Fantastic!! Looks so great. It’s gorgeous!!! Totally Amazing! LOVE THE COLOR! Absolutely beautiful. I’m jealous of your math skills! Breathtaking. Really. I had to take another breath when I saw that first photo. And stunning with the black background. I’m catching up on everything I missed while I was away for the holidays, and oh my goodness, I’m sorry I missed the debut of your Sea Silk Melon scarf! It’s to die for. A useful size, a great color, and I really like the way the border substitution worked out. I want one just like it! I know I’ve commented on this post already, but I come back to visit it from time to time. I just received two hanks of Sea Silk in the Woodlands colorway. Mine do smell like the ocean. It’s pretty weird and cool at the same time! I plan to use on hank for the melon scarf, since I’ve been totally inspired by you! Do you think it’s a decent first lace project?